Fisher, D.S., H.F. Mayland, and J.C. Burns. 1999. Variation in Ruminants’ Preference for Tall Fescue Hays Cut Either at Sundown or at Sunup. J. Anim. Sci. 77:762-768. Cattle, Sheep, and Goats all showed a strong preference for the PM-cut hay, sometimes eating 50% more of the PM hay. This preference, indicated by dry matter intake, was associated with greater total nonstructural carbohydrate (TNC) concentrations. The TNC’s accumulated during the day, diluting acid detergent fiber (ADF), and neutral detergent fiber (NDF). Fisher, D.S., H.F. Mayland, and J.C. Burns. 1998. Variation in ruminant preference for alfalfa hay cut either at sundown or sunup. J. Anim. Sci. 1998, 76 (Suppl. 1, Abstract # 753). Technical manuscript being prepared. A 2nd technical manuscript is being prepared on long term dry matter intake and in vivo digestibility by steers. Like with the tall fescue, alfalfa was grown in 1997 near Kimberly, Idaho swathed on PM/AM schedule, baled, and shipped to Raleigh, NC where is was fed in ‘preference’ study to cattle, sheep, and goats. Hays were offered alone as meals to each animal during an adaptation phase prior to the experimental phase. In the experimental phase, each possible pair of hays (15 pairs) was presented to sheep and goats for approximately 2.5 h and to cattle for approximately 0.5 h Presentation of the pairs was randomized. In all three harvests in the three experiments, preference for PM hays was greater than for AM hays (p<.01). Shifting the mowing of alfalfa hay from morning to late afternoon was effective in increasing forage preference in these three ruminant species. Fisher, D.S., J.C. Burns, and H.F. Mayland. 1999. Diurnal Harvest Timing and Ruminant Preference for Switchgrass Hay. For presentation Am. Soc. Agron., annual meeting Oct – 5 Nov. 1999, Salt Lake City. Sheep preferred but goat varied in preference for PM vs AM-harvested switchgrass hays. This response was attributed to greater variability among the harvest treatments. This may be a climatic or genetic response. Dairy Cows will eat about 8% more of a total mixed ration (TMR) containing 40% afternoon-cut alfalfa hay than one containing morning-cut alfalfa hay and will produce about 8% more milk. Adjusting schedules to cut hay in afternoon and early evening can increase feed value of hay by 15%. Kim D. 1995. Effect of plant maturity, cutting, growth stage, and harvesting time on forage quality. Ph.D. Diss. USU, Logan, UT. Green-chopped alfalfa cut in the afternoon will have more feed value and is relished more by cows than if cut in the morning (Mayland, observation). When making silage from alfalfa or clover hay, one can enhance the fermentation process by cutting the hay in the afternoon compared to cutting in the morning. Owens, V.N., et al. 1999. Protein degradation and fermentation characteristics of red clover and alfalfa silage harvested with varying levels of total nonstructural carbohydrates. Crop Sci. 39:1873-1880. Dairy cows foraging pastures under 24-h strip grazing management produced 8% more milk when fence was moved after the afternoon milking (4pm) vs after early morning milking (6am). Orr, R.J., et al. 1998. Matching grass supply to grazing patterns for dairy cows under strip-grazing management. Report of Instit. Grassld. Leviron. Res., North Wyke, Okehampton, Devon, EX20 2SB, UK. Personal communication. Increased sugars in afternoon forage may explain increased bite counts in afternoon vs. morning grazing. Daily cycling of forage quality, especially as it affects animal eating behavior and economic value, has not been researched prior to 1995. Plant physiological data on sugar accumulations rarely included entire above ground plant material grown in full canopy in the field. 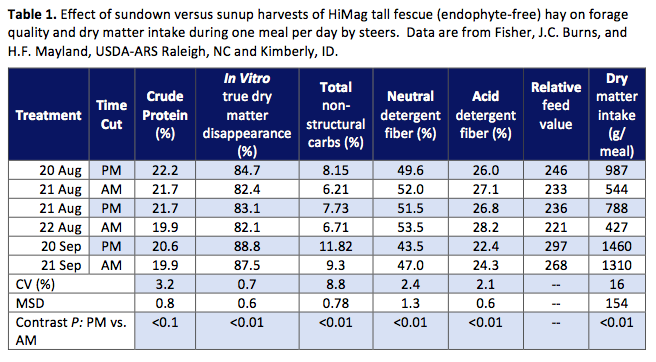 Unequivocal evidence of animal preference for sundown- versus sunup-harvested forage has led us to investigate and document gains and losses of soluble sugars at periodic intervals on 12 or 24-h basis. Shewmaker, G.E., H.F. Mayland, C.A. Roberts, P.A. Harrison, and E.A. Sleper. 1999. Carbohydrate Accumulation Rates in Tall Fescue. In preparation. Samples were taken at 2-h intervals, from sunup to sundown, from eight tall fescue cultivars, and four times during the season. 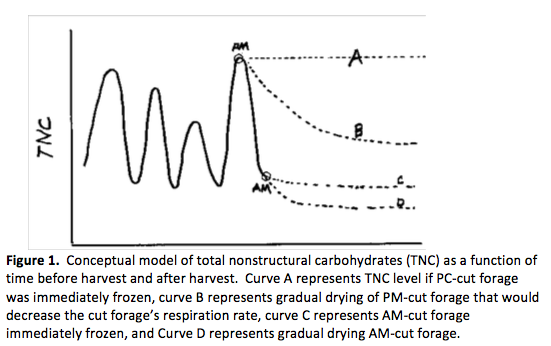 Over the time period of 2-h post-sunup until 2-h pre-sundown, total nonstructural carbohydrates (TNC) increased linearly from 222, 212, 127, and 98 g TNC/kg DM in May, July, Aug, and Sept. respectively at rates of 3.2, 2.4, 3.0, and 4.4 g TNC/kg DM / hr. Tall fescue forage samples taken for TNC determination should be taken within a 1-h period for values to be within 5% of mean, otherwise sampling times should be blocked. The linear portion of TNC values were plotted by cultivar against time. The TNC slopes were not different among cultivars. 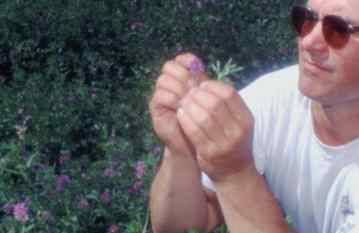 Intercepts were different for cultivars and were proportional to animal preference. Kenhy had the highest TNC intercept and highest cattle preference while Mozark had the lowest intercept and preference. TNC determination should be taken within a 1-h period for values to be within 5% of mean or sampling times should be blocked.